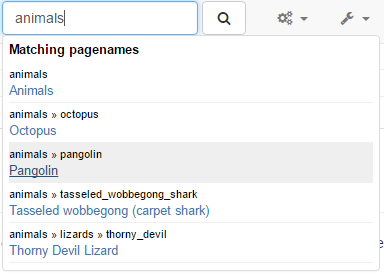 I've posted an Issue on the DokuWiki Github project describing enhancements I would like to see for the AJAX Quick Hits search box. I got most of the first two points done by hacking about with CSS in about 15 minutes, although items 3 and 4 are certainly more challenging. While I'm not a talented designer, nor a DokuWiki back-end expert, I do hack around with both design and server-side stuff, and I have already customized some plug-ins for my own needs. Therefore, over time I hope to make these changes come to life. Of course, I would appreciate any feedback, and especially any information or other practical help. I'm hoping to propose it for a future version of DokuWiki. Right now it's just hacked in, but if people are interested, I'll submit something on GitHub - of course the namespace hierarchy display would be optional controlled from config, since I'm sure not everyone wants that. This post was edited 2 times, last on 2017-05-07, 13:40 by FosseWay. Thanks for the feedback, molefunk. I was surprised that #1 and #2 aren't already done in DW core, so I might start by proposing a PR for just those. I'm already finding the namespace display useful on my own production wiki. I realise that I said I had #1, #2, and #3 working - this was a mistake, as #3 is the keyboard-up-down-enter idea, and I don't yet have that working. Sorry. I still intend to make this work though. I noticed a while ago that the Link Wizard has this functionality, so I imagine I can borrow it from there with a bit of work. 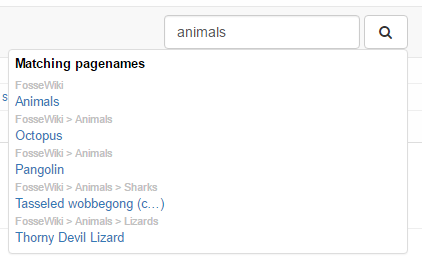 Yes, #1 and #2 seems like a natural addition to Dokuwiki. If you don't mind sharing #4, I'll be happy to experiment with it. I probably only want top level namespace displayed (to easily discern between books, wiki articles, index entries and user pages), and possibly floated to the right on the same line. I think having this as an option in Dokuwiki would make sense, as I think many people prefer to use useheading (at least for Navigation). But better to make them separate PR's. For sure. Here it is. I only hacked it in for now, so it's not in the unified diff form preferred by GitHub. so that it matches the directory structure seen in the URLs. I have useslash switched on on my wikis, but any eventual submission to GitHub should probably take useslash into account. Should also note that anyone well-versed in CSS/web design will probably have a much better way of doing this. I'm presenting this as a hack that does more or less what I want it to, but it may not be great design. For one thing, it would be nice if the whole <li> was a link to the page, so that the user doesn't have to click only on the link. I'll try to get that done this week. That looks like a great seek for an solution, FosseWay.